Benjamin Franklin was one of the great minds in American history, a Founding Father of the country who was a worldwide acclaimed scientist and inventor. He was considered so brilliant that he may even have had Carlos Boozer in mind when he invented the lightning rod. The lightning rod, of course, was designed to draw the most dangerous flashes and thus protect the rest of the area from damage. So in a sense Boozer has become the Bulls’ lightning rod, a flash point drawing the most startling attention of the critics even as not exactly everyone else is in contention for MVP or Defensive Player of the Year. This week, Boozer drew attention for his plea to play more in the fourth quarters, when he often is removed for Taj Gibson for defensive purposes. Bulls coach Tom Thibodeau said repeatedly nothing has changed and he’ll play whomever gives the team the best chance to win, at least in his view. 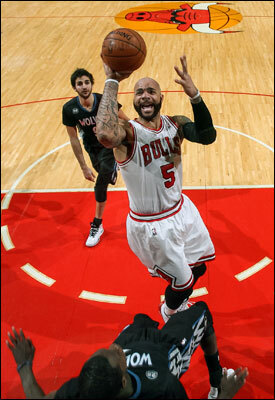 But there was Boozer back in the game against the Suns Tuesday with about four minutes remaining. And it was Boozer after the Suns cut the Bulls lead to 93-89 with 2:09 remaining taking an inbounds pass and making a strong move to the basket for a layup that effectively clinched the victory as the Bulls move on to Golden State Thursday. “Big time play. It gave us a cushion when we were close to being a one possession game,” said Thibodeau. Boozer finished with a team-high 19 points to go along with 12 rebounds. He is averaging 14.8 points and 8.6 rebounds for the season in just under 30 minutes per game, his fewest since his rookie season. After less than 30 minutes played against the Spurs and Pelicans in the start of the Western Conference road trip, Boozer went public with a rare, albeit mild, complaint about his playing time. Why now after all this time? Why at all? Thibodeau, of course, dismissed it all and it really wasn’t much, anyway. But good for Boozer. That sort of thing with the strong character the Bulls have generally proves a positive for the team. Though Boozer never talks about such things, it’s had to be a difficult season for him with all the talk in the media of an imminent amnesty for him after the season. It’s possible since this is the last summer the Bulls can use amnesty on Boozer. It would get the Bulls below the salary cap to pursue a minor free agent or their rookie in Europe, Nikola Mirotic, if they do choose that option. That hasn’t been determined. Plus, Taj Gibson’s offensive play has improved. So he’s been eating into Boozer’s playing time. This is not a Bulls team from which you hear much complaining. Unless you are game officials, of course. So it was a surprise when Boozer delivered his relatively tame plea. Especially for a Bulls player. Because that sort of stuff used to go on almost weekly with the championship Bulls. Horace Grant on the eve of the first playoff game with the Pistons in 1991 ripped into management for something or other. So then he went out and led the team in rebounding in the win. Scottie Pippen did that sort of thing regularly even to the point of saying he would retire rather than play for the Bulls early in the 1997-98 season. Then he returned and was a crucial part of the sixth championship. Michael Jordan once refused to shoot in a playoff game because he supposedly wasn’t getting enough players involved. These are highly competitive, proud people in a demanding business. Sometimes it becomes too much. But they have an outlet most workers don’t. They have media around regularly and generally guaranteed contracts. Most workers would love to blow off some steam. When you do it can take you from pouting or feeling sorry for yourself or depression to often a feeling of a weight lifted from you. But then you also are challenged to show you are correct and the company was not. Most workers cannot do so because they don’t have the job security of professional athletes. And even though basketball players are paid millions of dollars and are in glamorous positions most would do anything to reach, it is a job. No matter how good it is and how lucrative, if you have to be there and take direction from someone else it’s a job. And because it’s called a game doesn’t mean it’s fun all the time. These are humans and not robots and even if their workplace is a bit unusual, it has many of the same issues with jealousies, resentments and regrets. We just get to hear or read about many. So what Boozer said was not only making a plea for more playing time—whether to respond to frustration about his future or enhance it—but it was challenging himself. OK, you want to play, Thibodeau, in effect said by putting Boozer in there, show us. Boozer did. He can fall into traps of shooting too many jump shots. But he was aggressive attacking the basket and strong off the boards in the win in Phoenix. The Bulls, the lowest scoring team in the league, are better when he can do that as it also opens the perimeter more. The Bulls made six threes against the Suns. Boozer, in a sense, is a victim of his own ambition. He became a free agent in the greatest free agent summer ever when the Heat put together its title team. The Bulls tried for all those players and lost out. So they signed Boozer. Not that he was a booby prize. But he wasn’t LeBron. The Nets and Knicks and a few others tried and didn’t even do as well as the Bulls. But when your community hopes for LeBron James, you’re going to get scrutiny if you are the next guy. Boozer always has been known as a limited defender. But because he was with the Bulls, and little difference than he ever was before, he’s become a target of fan and media criticism at times over defense. The truth is as good a defensive team as the Bulls have been, there always have been two or three weak defenders among them. None have been condemned as Boozer has been. Even very good ones like Jimmy Butler are often beaten off the dribble. It’s often impossible to play great defense on any regular basis in the NBA. Especially with so many rules against physical contact. But Boozer rarely has reacted to the slings and arrows of outrageous public misfortune. He’s actually, in a way, provided cover for teammates who have not always been terrific on defense. You can’t see what everyone does or even what the assignment was. So blame Boozer. He’s had the tough exterior to take it and it’s probably helped the group. So maybe he’d had enough after the last week. He never much says and it didn’t much bother anyone else. But in a way Boozer put himself on the spot where he had to, as the idiom goes, put up or shut up. He came up big for the Bulls in Phoenix. Boozer was talking about the Kings loss transitioning to the Suns victory. But he might have been talking about his own instant renaissance. Well done. Which as Benjamin Franklin said, is better than well said. Who knew Carlos Boozer could be such inspiration.